Heat oven to 325°F. In large bowl, stir cereal, popcorn and peanuts to mix; set aside. In 1-quart saucepan, heat corn syrup, honey and butter over medium heat, stirring frequently, just until mixture begins to boil. Remove from heat. Stir in vanilla. Pour syrup mixture over cereal mixture; stir until cereal mixture is evenly coated. Pour mixture into ungreased 15x10x1-inch pan. With rubber spatula, spread mixture until even. Bake 20 to 25 minutes, stirring once or twice, until mixture is crisp. While mixture is baking, place sheet of waxed paper on work surface. Immediately pour baked mixture onto waxed paper; spread out into a thin layer. Cool completely, about 30 minutes. 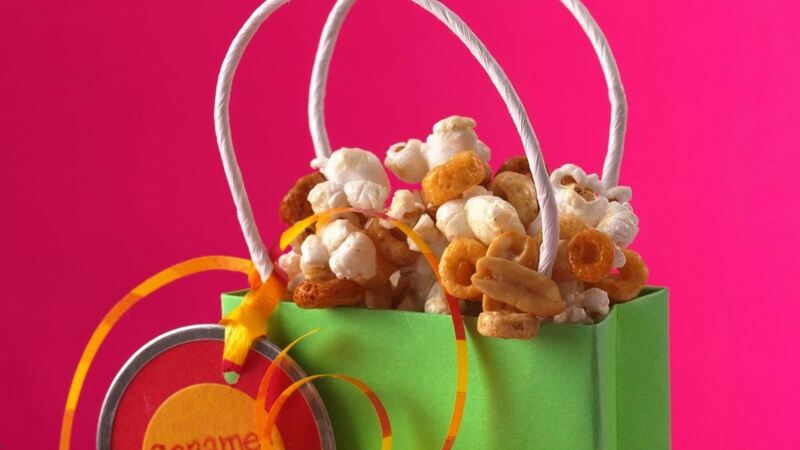 Break caramel corn into pieces. Store in tightly covered container. You don't have to limit yourself to peanuts in this recipe. Try cashews, pecans, walnuts or even a mixture of nuts.